"We encourage our communities to leave intervention to the police." A Conservative candidate who wore camouflage and hid in a bush at night to catch a sign vandal has been reminded to let police handle the situation next time. 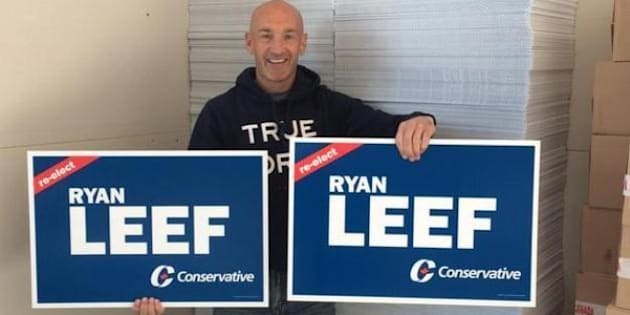 Incumbent Yukon candidate Ryan Leef made headlines after he put a woman under citizen’s arrest last week for allegedly defacing his campaign signs. Yukon RCMP issued a statement titled “Citizen’s arrest of mischief suspect” on Thursday to warn the public to think twice about mirroring the Conservative candidate’s vigilantism. Citing a section of the Criminal Code, Mounties reminded that Canadians can only make arrests in “specific” situations. “We encourage our communities to leave intervention to the police, who are trained, equipped and have broader legal authorities than the average citizen,” it read. They outlined how officers had responded to a report of someone sabotaging election signs on Aug. 27. Whitehorse resident Carrie Boles admitted to vandalizing about half a dozen of Leef’s signs. She said she just had a enough of seeing the “gaudy signs” posted along a stretch of the Alaska highway near her home. I am a 110-pound woman standing on the edge of a dark stretch of the Alaska Highway, as my left arm is being twisted behind my back and my body is being forced to the ground. My final thoughts: “Ouch that hurts,” and the distasteful idea of a potential sexual assault. Then she recognized Leef’s voice. “I was like, ‘what are you doing sir, out here at 11 o’clock at night in the pouring rain, protecting your campaign signs?’” she told CBC Radio. Mounties later arrived on scene and Boles was let off with a warning. Leef later defended his actions, telling the broadcaster his experience as a former member of the RCMP taught him to be prepared.